Pullups are not inherently dangerous like some upper-body exercises, such as dips. However, because of the overhead arm position and shoulder movement involved in the pullup, you could experience a rotator cuff injury. Reduce your risk of injury by avoiding certain styles of pullups and proactively strengthening your rotator cuff muscles. The rotator cuff is a group of four muscles -- teres minor, infraspinatus, supraspinatus and subscapularis -- that lie under part of the shoulder blade. They are responsible for stabilizing the highly mobile shoulder joint. The rotator cuff muscles are small and not particularly strong. This makes them prime candidates for injury. Some common rotator cuff injuries include strains, tears, dislocation, separation, impingement and sublaxation. Biological factors, such as the structure of your shoulder joint, can make you more susceptible to a rotator cuff injury. You can injure your rotator cuff muscles if you fall on your shoulder or sustain trauma to the shoulder. Other, more subtle, causes of rotator cuff injury include repetitive stress on the shoulder or repetitive shoulder motions, especially overhead movements such as the motion that occurs during pullups. The pullup movement puts the shoulder joint in a compromised position of external rotation with significant loading on the rotator cuff muscles. If you do pullups regularly, the constant overhead motion can make you prone to a rotator cuff injury. Replace the pullup with a different exercise that works the same muscles, such as the bent-over row or seated row. You can also use different pullup grips. A neutral-grip pullup -- your palms face each other -- reduces the stress on the shoulder joint during the movement as your shoulders do not externally rotate. Some variations of the pullup are more likely to result in a rotator cuff injury. 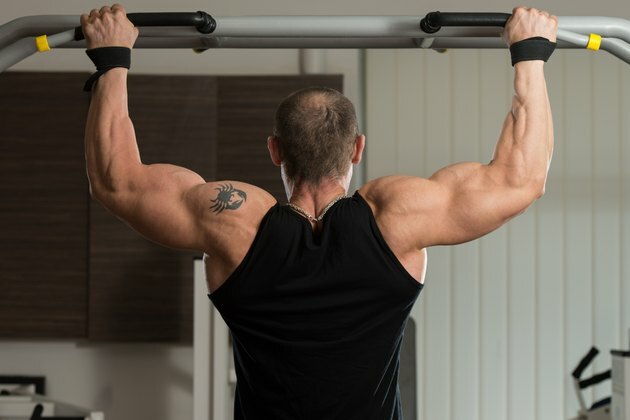 Behind-the-neck pullups, where you pull yourself up until the back of your neck touches the bar, place your shoulders in extreme external rotation and increase your risk of injury. To reduce the likelihood of a rotator cuff injury, proactively train to strengthen the rotator cuff muscles. Use light weights to perform a series of internal and external shoulder rotation exercises. Do these exercises at the end of your shoulder workout. Complete three sets of 12 to 15 repetitions of each exercise. Stop the pullup movement if you feel any pain during the exercise. Consult a physician if you have shoulder pain, numbness or weakness. Do Deadlifts Stress the Rotator?